Chris is the organizer of Palenque Norte events. In 2012 he collaborated with the original founders of Palenque Norte in order to revitalize the event after a five year hiatus. He handles budgeting, scheduling, bookings, content development and logistics. Tom is the mastermind who designs and controls the AV infrastructure at Palenque Norte events, and he also archives all of Palenque Norte's content. Additionally, Tom is a talented digital artist, and his graphics and artwork are featured on this site and at Palenque Norte events. 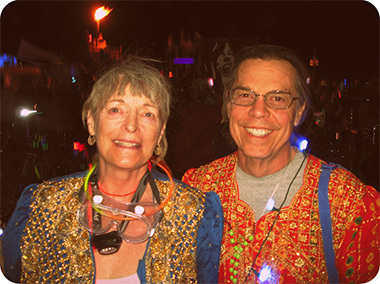 Lorenzo and Marycie Hagerty co-founded Palenque Norte in 2003, and organized Palenque Norte events at the Burning Man festival through 2007. Lorenzo is also the host of the popular Psychedelic Salon podcast. 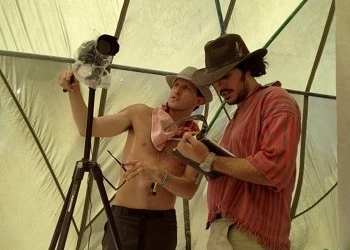 Lorenzo supports Tom and Chris in running Palenque Norte events, and broadcasts the recordings on his weekly podcast.